AT&T presents the AT&T Solution Provider Champion recognition to Solution Providers who go above and beyond to serve customers. SP Champions are named annually based on overall performance among AT&T’s National Alliance Channel Members. 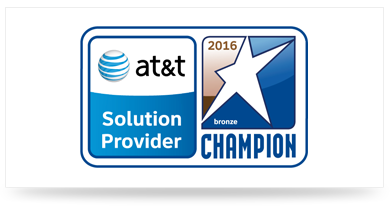 “I’m proud to have TeleProviders recognized as a 2016 AT&T Solution Provider Champion, once again. Our goal is not only to meet, but to exceed the criteria set by AT&T each year,” says Jason Sharek, CEO of TeleProviders. • Proven expertise in providing solutions for customers, with consistently high levels of performance. • Single point of contact for the development of integrated solutions ranging from simple to complex to fuel customers’ growth. • Customer support synergy by combining their own capabilities with the power of AT&T’s Network Management, Customer Care and Billing. • Technical expertise developed through rigorous training and robust learning curriculum.